Yikes is there trouble in the Romo/Simpson paradise? Romo missed his flight to Grand Rapids, where Jessica Simpson is performed at Van Andel Arena. 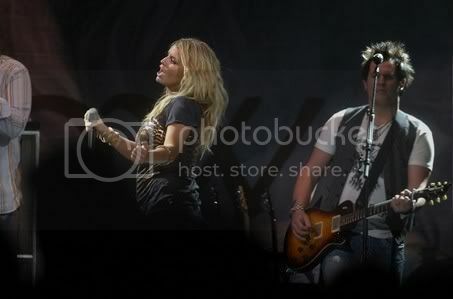 The pop singer/actor turned country artist told a crowd of about 8,000 that she plans to see Romo on Friday. "I’m so excited, I get to see my boyfriend tomorrow," she said shortly after opening her set with a cover of "These Boots are Made for Walking." Introducing her song "You’re My Sunday," which she wrote for the Dallas Cowboys quarterback, she said. "He’s the person who makes me relax." While singing the ballad "With You," she paused during the middle of the song to take a drink of water while her backup singers took over the lead vocals. After the song, she seemed a little embarrassed and said it’s difficult to be on stage and be so vulnerable. During the evening she continuously struggled with her ear monitors and often seemed to lose her place in several songs. She even had the band start over on the up-tempoed "Pray Out Loud." The evening only got worse toward the end of her opening slot for Rascal Flatts, completely forgetting the lyrics to her single "Come on Over" and asking for forgiveness from the audience by mouthing the word "sorry" on the two video screens. Things were so bad, while introducing her closing song "Do You Know," she talked about how she felt like walking off the stage. At the end of the song, she thanked her band for "having her back." And it looked as if she was wiping away tears as she walked off the stage. Jessica Simpson Talks about Divorce and Quite About Her New Man! Is Jessica Simpson Planning to Adopt? WTF Happened to Jessica Simpson?